Similar concerns were raised last year by NPR investigative correspondent Laura Sullivan and ProPublica. They unearthed scathing reports about how the Red Cross responded to the Haiti quake and Superstorm Sandy, which slammed the American East Coast in 2012. “They were spending a lot of their time and money on public relations. And they had diverted a number of assets in Sandy — and in a couple of other hurricanes — to PR efforts and not to helping people,” Sullivan tells us. 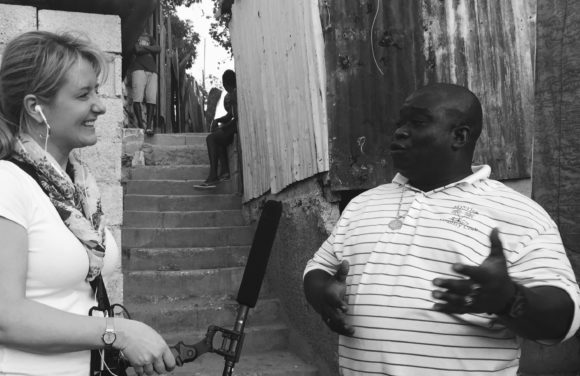 Featured image: Laura Sullivan reporting from Haiti, on the Red Cross’ response to the 2010 earthquake. Photo courtesy of Sullivan.